You don’t remove style formatting from text in Word 2016 as much as you reapply another style. The only official way to remove a style is to replace it with the Normal style. 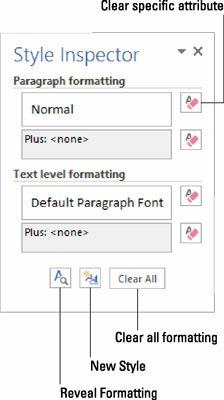 Because many Word users don’t understand styles, Word comes with Clear Formatting commands. You can see such commands referenced in this figure, which illustrates the Style Inspector. Clicking those buttons simply replaces the given style with the Normal style. The Word 2016 Style Inspector. If all of Word’s formatting commands are ingredients, a style is a recipe. It’s a single command that applies a virtual stew of formatting commands, all at once. Even better, when you update or change a style, all text formatting using that style changes as well.